If there is one word to describe the amazing Cameron Boyce, it would definitely have to be: stupendous! Cameron Boyce is truly one of the most talented individuals to walk this planet and words fall short when describing just how phenomenal he is. Cameron Boyce has exhibited his talent in many renowned and fan-favorite projects including Disney Channel’s hit show, Jessie, where he portrayed the role of Luke Ross on the show. Cameron Boyce has proven himself to be talented in any and every way possible as in addition to being a natural on-screen, Cameron Boyce also excels in voice-acting as well. Cameron has also done voice-acting for the incredible, animated show, Jake and The Neverland Pirates. It doesn’t stop there. Cameron Boyce’s extraordinary acting resume also includes working on shows such as Gamer’s Guide to Pretty Much Everything, Bunk’d and movies such as Grown Ups, Descendants, and Disney’s highly-anticipated sequel, Descendants 2. Cameron Boyce shows how much of a versatile actor he is and how he can take on any role and do it justice. Cameron’s awe-inspiring talent always shines in everything that he works on and he has and continues to make an everlasting mark in the entertainment world and establish himself as a profound and remarkable actor who can’t be beat. Cameron Boyce stars as Cruella De Vil’s son, Carlos in Disney’s marvelous film, Descendants and now, we are all counting down the days until we can see Cameron Boyce in the new Descendants 2 movie. In addition to being a wonderful actor, Cameron Boyce is also a terrific dancer, so basically he can do it all. Despite all of his massive success, Cameron Boyce remains to be one of the most genuine and down-to-earth people in the entertainment industry, which furthermore validates why he deserves all of his successes and there will only be more coming. Cameron Boyce defines what it is like to be a hard-working multi-threat who has definitely touched the lives of many through all of his mesmerizing work. I, Alexisjoyvipaccess had the greatest honor of covering and attending the prestigious and slime-tastic 2017 Nickelodeon Kids’ Choice Awards again and had a brilliant time catching up with and interviewing the sensational Cameron Boyce again at the event. 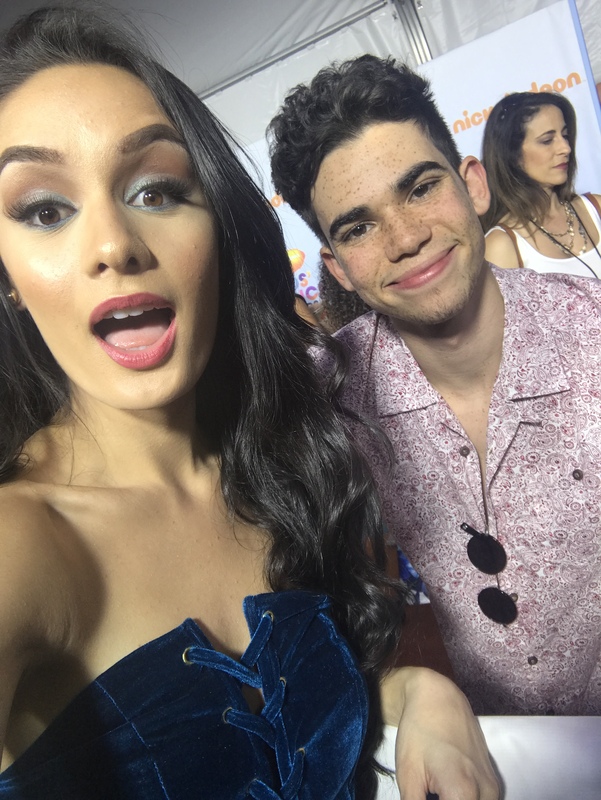 Cameron Boyce dished exclusively to Alexisjoyvipaccess all about what it was like working on set of Descendants 2, who he would have liked to see slimed at the Kids’ Choice Awards, what advice he would give to fans on how they can finish off the school year in a great way, and so much more only in our VIPAccessEXCLUSIVE updated interview. Cameron Boyce even revealed the one word he would use to describe Descendants 2 – hear what he had to say in our VIPAccessEXCLUSIVE updated interview below. Thanks for another fun interview, Cameron! Check out my VIPAccessEXCLUSIVE updated interview with the spectacular Cameron Boyce at the 2017 Nickelodeon Kids’ Choice Awards below! Previous VIPAccessEXCLUSIVE: Casey Simpson Interview With Alexisjoyvipaccess At The 2017 Nickelodeon Kids’ Choice Awards! Next Article: Get Ready For A Bigger And Better Award Show As MTV’s Movie Awards Expands To Include TV Series!